For other uses, see Straight man (disambiguation). 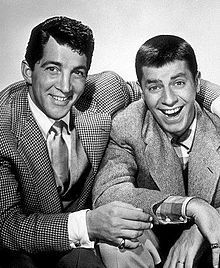 Martin and Lewis featured Dean Martin (left) as the smooth, debonair straight man and Jerry Lewis as the wild, oafish comic. The straight man is a stock character in a comedy performance, especially a double act, sketch comedy, or farce. When a comedy partner behaves eccentrically, the straight man is expected to maintain composure. The ability to maintain a serious demeanor in the face of even the most preposterous comedy is crucial to a successful straight man. Whatever direct contribution to the comedy a straight man provides usually comes in the form of deadpan. A straight man with no direct comedic role has historically been known as a stooge. Typically he is expected to feed the funny man lines that he can respond to for laughs, while seeking no acclamation for himself. In vaudeville, effective straight men were much less common than comedians. The straight man's name usually appeared first and he usually received 60% of the take. This helped take the sting out of not being the laugh-getter and helped ensure the straight man's loyalty to the team. Abbott and Costello, one of America's most popular comedy duos of the 1940s and 50s in radio, film and television, began as nightclub performers when the straight-faced Bud Abbott contrasted against the bumbling Lou Costello; Abbott, unusually, allowed Costello a larger paycheck to keep him on the team. The role is still found today in sitcoms. In the manzai comedy of Japan, the straight man is called tsukkomi. ^ Nachman, Gerald (1998). Raised on Radio, p. 36. Pantheon Books, New York. ISBN 037540287X. This page was last edited on 10 April 2019, at 22:03 (UTC).